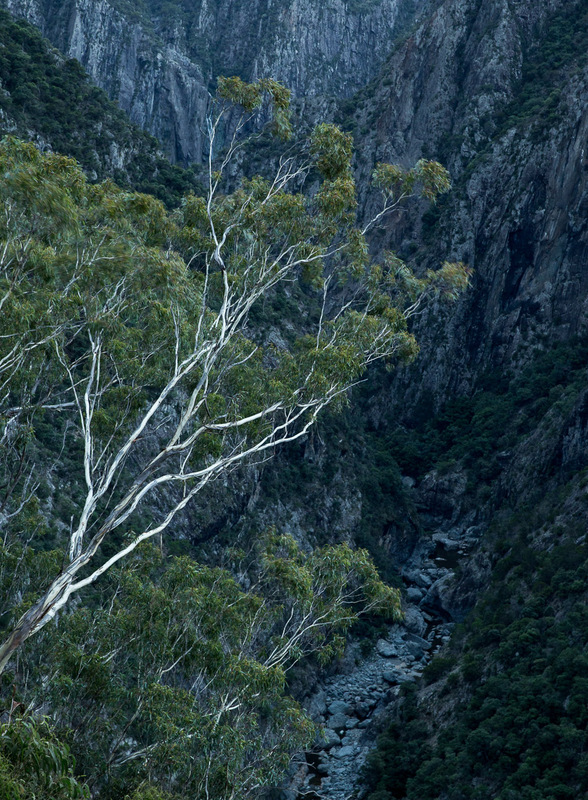 During my recent visit to the New England Tablelands (see Part 1 here) I travelled to Wollomombi Gorge. 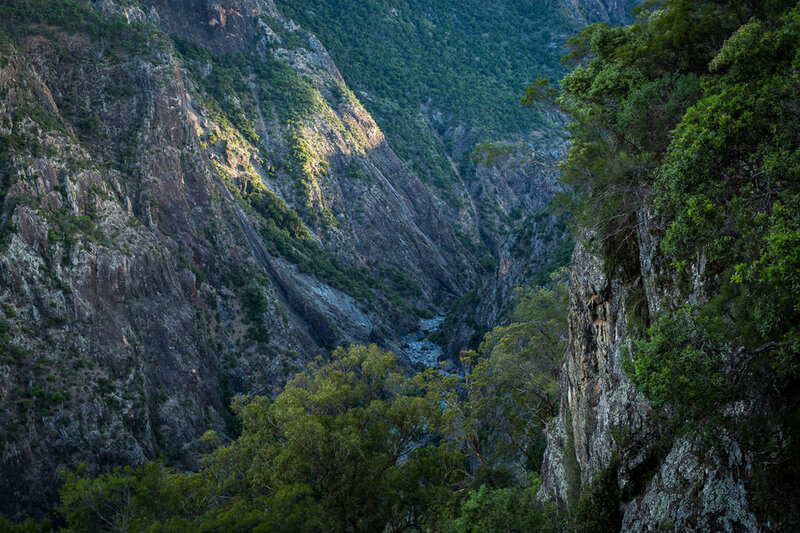 Within the Oxley Wild Rivers National Park and afforded World Heritage status, the Chandler and Wolomombi rivers plunge over the plateau into the deep and dramatic gorge below. 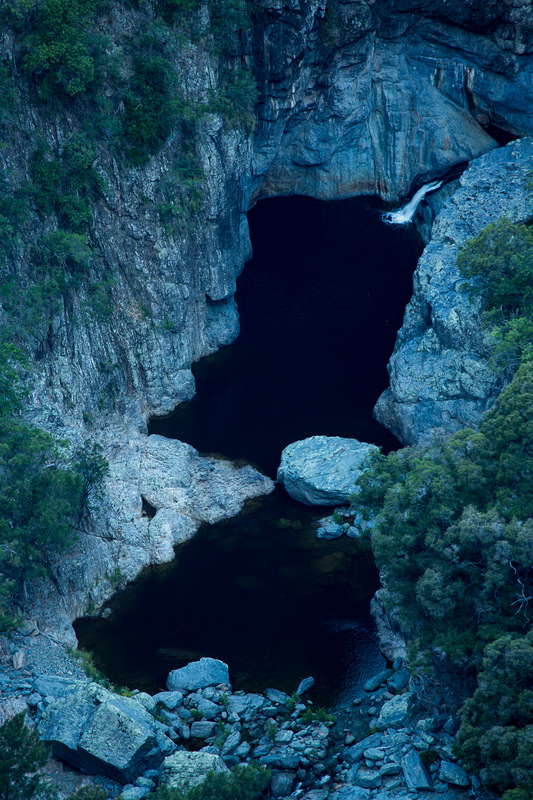 The name Wollomombi is said to be derived from the Aboriginal word “Wollumbi”, which means “meeting of waters”. "Wollomombi". It's a wonderful word isn't it? I love place names, particularly non-English place names. In Scotland, Wales, Iceland, or here in Australia, the native names for places inspire in me a sense of adventure and fantasy, they spark my imagination. It also seems to me that the native names are part of the landscape. Not just a name to put on a map so that someone can find it, they are descriptive and evocative of the place itself. They almost sound like the landscape. I’m minded, perhaps tangentially, of an article that appeared in the Guardian a few days ago by Robert Macfarlane talking about “rewilding our language of the landscape”. I think the language of a place helps our connection to it. It’s well worth a read and a think about (link). Returning to Wollomombi, my goodness it is some sight. Being 4 hours away it’s not exactly on my doorstep but I never expected to have such a grand spectacle so close to me. From other photographs I’ve seen, it is particularly breathtaking after heavy rain where the rivers turn into huge torrents and the base of the falls obscured by the spray thrown up. The conditions I experienced were less dramatic, but nonetheless very beautiful. I arrived about an hour before sunset hoping for some special light. As this was my first visit it was difficult to be certain where the light would be in this complex terrain just from looking at maps, Google Earth, TPE and other photographs. 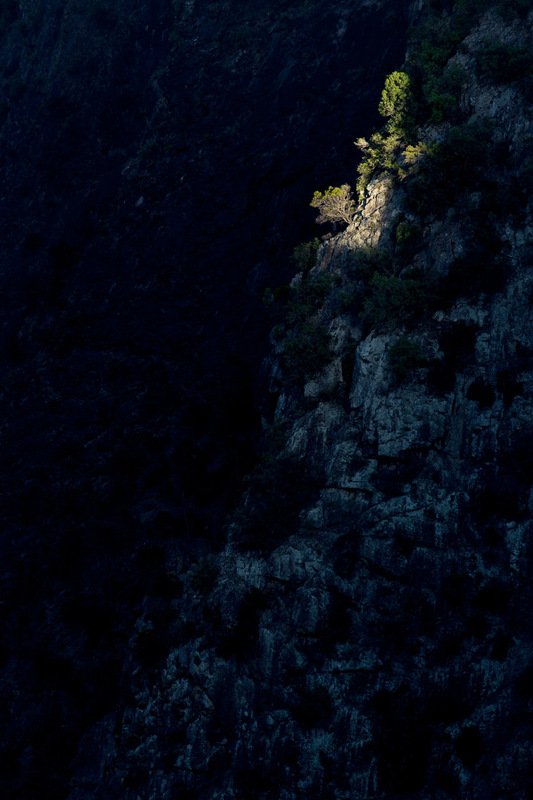 Conditions were pretty much as I expected however, the yellow sun catching the top of the gorge, deep blue shadow falling on the rocks below. 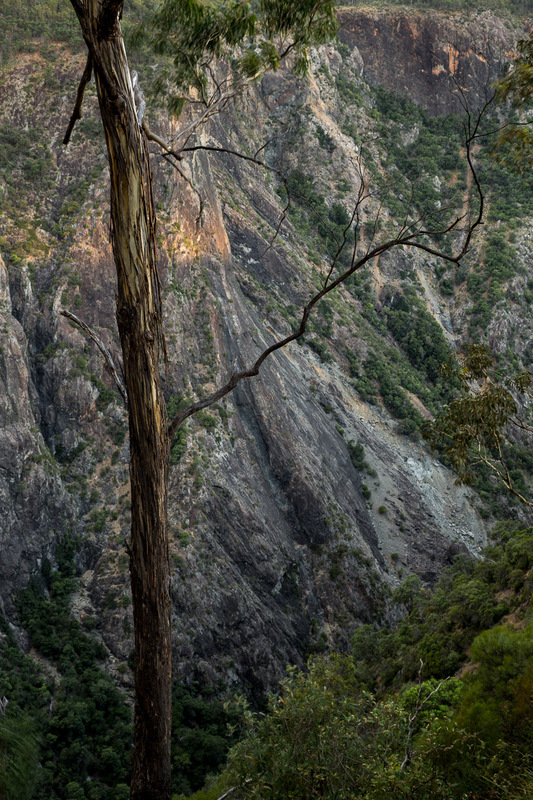 There are several lookouts as well as bush walks along the escarpment’s edge. As with Ebor in my previous post, most photographs of Wollomombi are taken from the couple of lookouts near to the car park. I started out with the ‘tourist’ shot but quickly switched to my 100-400mm lens to allow me to get closer to the falls and the gorge. As is often the case these detail shots were the most pleasing of my time there, though the stiff wind did its best to ruin a number of them with the lens fully extended to 400mm. With the obvious lookout shots done, I decided to follow the well worn cliff top path towards Chandler’s Lookout. It sounds like it offers brilliant views but sadly it is closed, I believe due to erosion. Note to NPWS it would be great if you could put the ‘lookout closed’ sign at the start of the path rather than at the end of it! One of the main things that makes the mountainous parts of Australia that I’ve experienced so far quite different to Scotland - other than that they have cattle ranches on top of them! - is that they are swathed in thick vegetation. For the most part British mountains have been denuded of their trees and vegetation, revealing their rugged rocky skeletons. 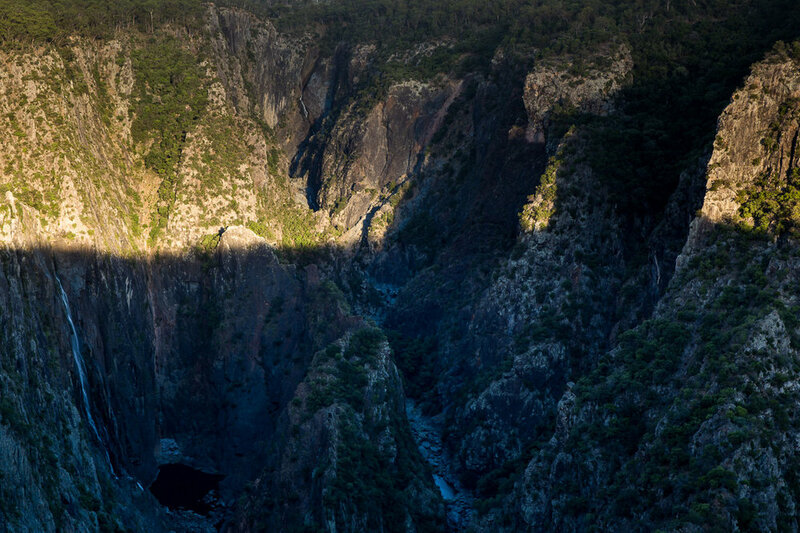 However in large parts of Australia, and certainly in the large and numerous National Parks, nature is left to its own devices and appears to conquer all. It is quite wonderful, and a real delight to spend time in this wild environment of rich biodiversity, some of which goes back to prehistoric times. As a photographer it does present some difficulties though. With trees everywhere, if you want to photograph something that isn't a tree then you can have a bit of a tough time. There are few tracks through the wilderness, and ‘going bush’ is at best left to those with more experience of this terrain and at worst discouraged. Even if you were to brave it, with limited detail on topographic maps and little hope of actually finding a clearing where nature doesn’t dominate, it seems pretty unlikely that your time would pay off. Contrast this with open access land in the UK, such as in the Peak District or the mountains of Scotland, where you can roam freely looking for something to take your fancy almost completely unimpeded (other than from the contours of the terrain itself). I remember wondering if, over the course of history, a human foot had trodden on every inch of land that I was looking at. Out here there is no doubt that nature dominates and man’s presence is very limited, albeit partly because a line has been drawn around it and the loggers haven’t moved in (yet?). There is a huge irony here. I catch myself cursing that I can’t get a particular shot because the trees are in the way, because vegetation seems to infringe the frame on all sides. And yet, is it not this glorious expanse of nature-run wilderness that I/we should be celebrating? As photographers I think we are too often guilty of wanting to tame the landscape, to turn it to our own advantage and a beautiful picture. Perhaps in many parts of the world, the landscape is willing - or has been bent too far - and photographs come more readily. Here though, on the fringes of man's domain, the natural landscape is less willing to pose brazenly for a photograph. Here and there can be found lookouts. On the roadside, or at the end of long bush tracks, where the land rears up and has been partially cleared to offer a better look at the wilderness that we walk through. Wooden platforms with metal rails. I’ve always tried to avoid using them for photographs. In most places with high visitor numbers, this is where a million photographs are made with naught but a few inches and a different time of day to pick between them. Laybys, lookouts and famous locations seem to me to be the least likely places to make compelling and emotive photographs. Yet here in this dense vegetation they provide the only respite from the claustrophobia one might feel spending hours walking alone in the company of trees and the strange sounds beyond them. It’s a strange dichotomy indeed. The walk above Wollomomibi was most lovely, yet the many trees continued to interfere with my photographic vision. 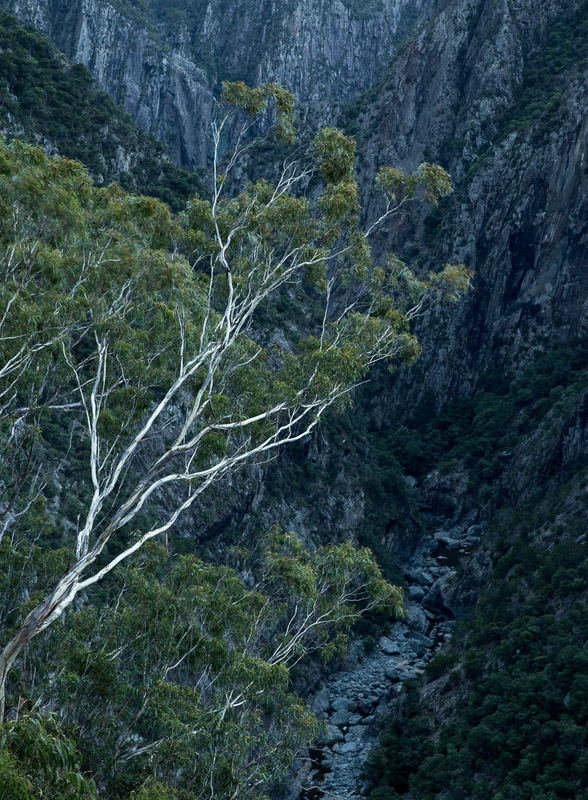 As I walked, I would look for gaps through the foliage to the dramatic gorge and the snaking river below. Sadly few presented themselves. At points I caught a glimpse of an opening and went off the path to take a look. But clearing one tree meant bringing in another couple. With the ground unstable and slippery, and a pretty big drop below, I decided that I would just have to make do as best as I could. I made a few shots that I was originally happy with, but my enduring feeling is that I have unfinished business here. I will return. And here I will learn to make the most of the wonders that nature presents me. I will worry less about simple, denuded compositions. I will instead use the trees as a more effective element in the photograph to tell a truer story of Nature's Domain. One of the things I've been developing over the last 6 or more months is a more creative approach to the use of shutter speed. Rather than a 'short' or 'long' binary switch, I like to consider shutter speed as an analog dial allowing us to dial up or down the degree of detail in the water to taste and to suit a particular shot. I particularly love the streaking that gives the water a sense of personality when using a mid-length shutter speed of 1 second plus or minus 2/3 second. Though it suits some shots, I think full detail in the water often provides a confusing and distracting element in a frame. Conversely a very long shutter speed pushing the water exposure towards white for the 'silky water effect' removes any sense of character in the water, it just becomes white blobs in the frame. In between the two though there's the possibility of retaining some of that detail, that real sense of flow and undulation. I often wonder why, when presented with raging torrents and stormy seas, we want to tame them into placid milky foam. In these elemental environments it is precisely the raw power and personality of the water that I want to capture. If it's a raging torrent, let it be so! I thought I'd share an image from Glen Sligachan to show you what I mean. Here's the first shot, looking towards Marsco down Glen Sligachan and the raging torrent that is Allt Dearg Mor (the one the footbridge crosses). Not a unique shot, indeed quite popular though most tend to shoot towards Sgurr nan Gillean and the Cuillin Ridge rather than Marsco, which I think is a particularly photogenic mountain. Still, I find it impossible to drive past Sligachan without stopping such is its beauty. Already aware that I prefer to avoid very long shutter speeds these days, this shot was made at 1.6" at f/16 and ISO100. I had a polariser and a 3-stop neutral density filter on, the combination of which will block out between 4 and 5 stops of light. It's quite a nice shot I think, but when I look at the water it feels too placid. In particular, the white of the plunge pool holds very little detail and as a result interest. It's quite a large expanse of an image to be close to white and unsettles me. Note that with other more gentle cascades you may find that 1.6" would retain reasonable detail in the plunge pool. Conversely with a large crashing waterfall, even 0.5" may record too much foamy movement in the plunge pool to keep any detail. The point here is that each time you encounter water you need to use some judgement and spend some time getting to know it to choose the perfect shutter speed. Each shot has a perfect shutter speed, but it's not fixed it's something you have to discover. For the next image I've pulled out the 3-stop ND filter and I'm now using a 1/5th shutter speed. Note that in so doing I've nudged my polariser and there's a lot more glare on the rocks - oops! This is the main reason I often use a polariser around waterfalls. Looking at the water itself there's a lot more detail in there and so to me sense of motion through the frame. Let's inspect more closely side-by-side. The overall feel of the water in the shorter exposure is much more like what I would associate with a turbulent pool and a raging river. Observe that the exposure is still long enough that the detail has been 'smeared', so we don't have the full detail but rather the implication of detail. Unfortunately the shorter exposure was just a tad under exposed, and the glare on the rocks from that nudge on the polariser means I'm not fully happy with this frame as is. Instead I take both exposures into Photoshop as separate layers (in Lightroom, select both, right click, "Edit In", "Open as Layers In Photoshop") and I use a layer mask to 'paint in' the more detailed water. You may also note that I've dialed down the opacity of the layer with the water exposure to 53% to reduce the extent of the detail in the final frame. Actually having a separate exposure like this allows me to dial the detail up and down as suits my taste back in the studio. There's a few more tweaks I've made elsewhere in the image to result in the final image below. Some may prefer the original, smoother version but I much prefer this more turbulent rendition of Allt Dearg Mor and Glen Sligachan; for me it better suits its wild feeling location. 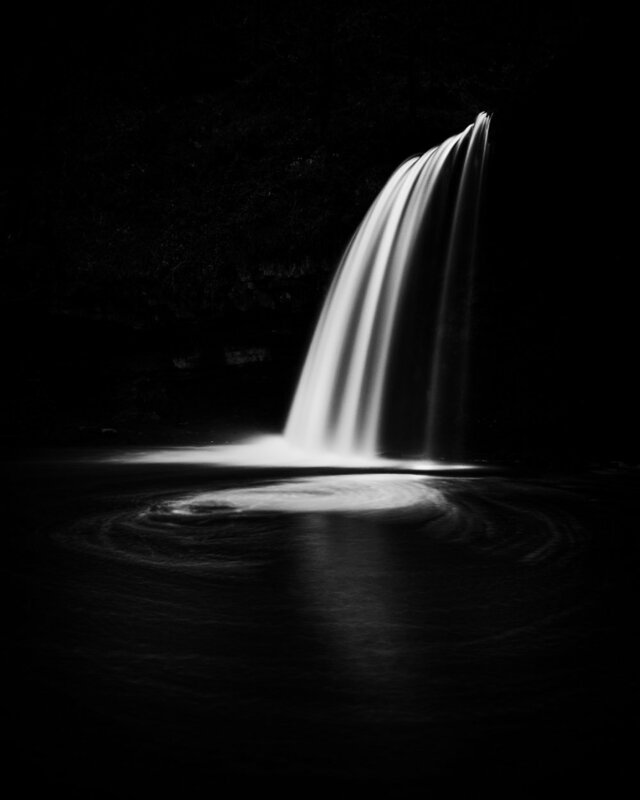 I am pleased to show you "The Sgydau Series", a collection of images of southern Welsh waterfalls in the Brecon Beacons. Waterfalls are something that I've been drawn to ever since I was a lad. They fascinate me with their varying personalities, some gentle and serene, others raging torrents. I visited the southern Brecon Beacons for a long weekend with the intention of shooting the many waterfalls in the area particularly along the Nedd Fechan, Pyrddin, Hepste and Mellte rivers between Pontneddfechan and Ystradfellte. It is with quite some justification that this is called Waterfall Country - there are a truly breathtaking array of waterfalls. What I really like about the area is that though it's a well known location, it hasnt been "tourist-fied". It still feels like you're going out in the wilderness to some degree. You can get close to the falls without metal railings getting in the way and some of the better views require getting off the beaten path and finding a way down the steep sided gorges. "Mission" below is so named for the journey in and out rather than the image itself! It's a fabulous part of the world and one I hope to visit on numerous occasions. I chose this area as I had seen a couple of the more well known falls, in particular Sgwy Ddwli, appearing on Flickr photostreams during early autumn. Given my penchant for waterfalls I had to investigate further. When I discovered just how many falls there were in the area I was gobsmacked and was immediately arranging a cottage for a long weekend (or rather, my wife was - she's awesome at stuff like that). Conditions for my trip weren't quite as expected. My visions of the place were based on late summer and autumn, with the vibrant foliage of the many trees that cling to the side of the gorges playing off against the beautiful falls. Given I was going at the end of November I knew that the autumn colours would be past their best if not all but gone. Worse, in the days leading up to our trip the UK (in particular the south west) was hit by an incredible amount of rainfall with widespread flooding that caused a lot of damage. Indeed with over 300 flood warnings in place the night before our trip I wasn't sure if we'd even go. Fortunately the weather abated and we made it down with relatively little flooding in evidence. I had done some research on the area and knew where the key locations were, but I still had that nervous, unprepared feeling as we arrived on the Friday. I wasn't certain where I would go on the Saturday morning or what to expect, and I didn't want to waste any of my precious time. In the fading light I walked up from the Angel Inn in Pontneddfechan to Sgwd Gwladus and I'm really glad I did. As expected most of the foliage had gone and there was little colour left in the scene. The heavy rain meant the rivers were swollen and the falls in full flow, though perhaps not as bad as I feared. I shot about 15 images which really helped me decide my approach for the rest of the weekend. 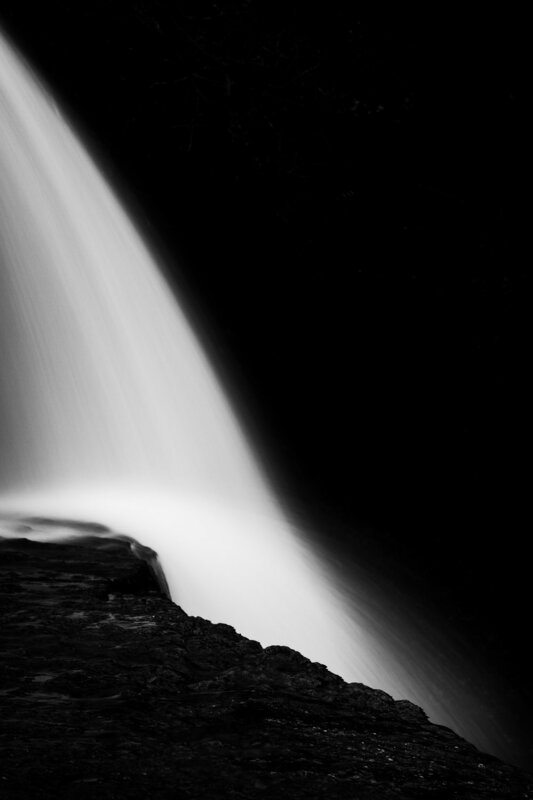 I had already decided that I wanted to create a coherent body of work - not just individually nice images, but images that I felt told some of the story of my time with the falls. With the lack of colour and the lovely gushing falls, as I looked at my images of "The Lady's Falls" on that Friday night I realised that, should the rest of the weekend pan out in a similar way, focusing in on the water to the exclusion of almost all else was the approach I wanted to take. This led me to the stark, high contrast black and white shots that you will see in the series below. Why "Sgydau"? As you might guess from some of the images below "sgwd" means waterfall in the local dialect of southern Wales, and "sgydau" is it's plural-form. I find Welsh (and Gaelic) incredibly evocative languages, they create fantastical connections in my brain in a way that English simply fails to do. I'm not sure if the languages purposely evolved that way, or if it's just my imagination and sense of adventure playing tricks on me, but to me they seem at one with the landscape, almost like the words describe the landscape in some ancient and deeply connected way. Regardless, I like to maintain this link between the local language, landscape and my images. If you click on the image below it will take you through to the gallery for "The Sgydau Series". It's one of my first conscious collections of work and one I am very happy with. In some ways it's very aligned with my existing work, and in others represents a bit of a departure. I hope to add to it and see it evolve over the coming years.